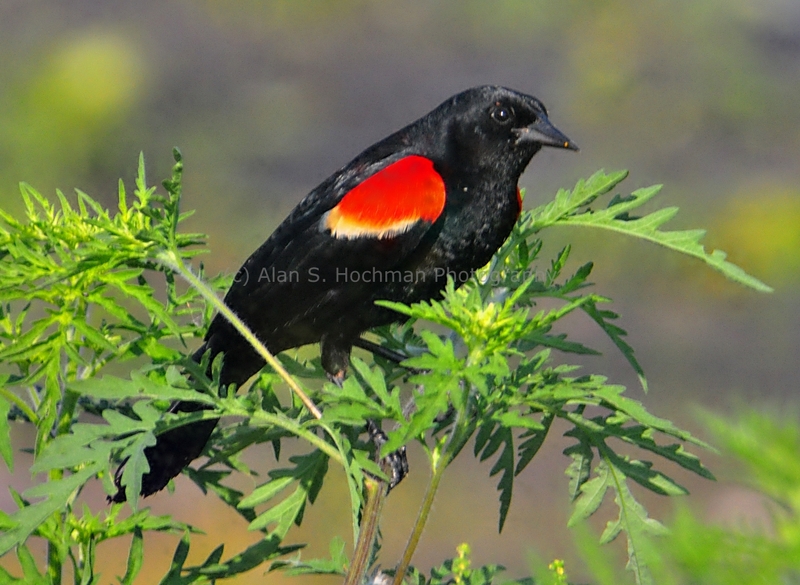 This photograph of a Red winged Blackbird was taken at the HoleyLand Wildlife Management Area. This WMA is located on Okeechobee Road (US27) at the Broward County-Palm Beach County crossing. The camera used was a Nikon D90 with a Tamron 28-300mm lens at full zoom. The Red winged Blackbird (Agelaius phoeniceus) grows to a lenth of approximately 9 inches. The male Red winged Blackbird is glossy black, with red shoulder epaulets that are bordered by yellow. The yellow and much of the red is less visible in late summer and fall. The bill of the Red winged Blackbird is faitly long, pointed. Its eyes are black and its tail is fairly long and rounded. The call of the Red winged Blackbird (a harsh check, high tee-eek) is usually heard from trees, shrubs and tall weeds, and its habitat is marshes, swamps and fields.The Red winged Blackbird is a year round resident of Florida.